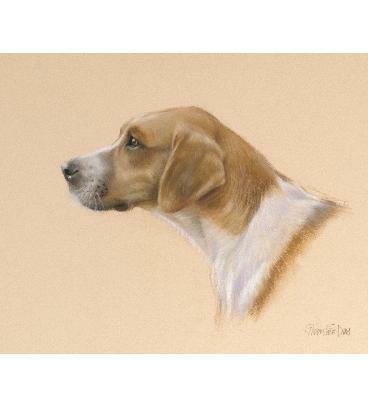 The portraits of animals are painted from a combination of life and 'photos; I make colour notes and character studies from life and then the main portrait is worked up from the sketches and 'photos in my studio. I also like to make oil or pastel sketches of animals from life if possible, but I work mainly from 'photos when painting detailed portraits of animals. I can work entirely from 'photos if necessary, subject to the 'photos being suitable. Sizes vary, but head portraits are usually painted at just under life size. Commissions to work entirely from clients' own 'photos are sometimes possible- please feel welcome to email 'photos for consideration with no obligation. Please allow approximately one month for a portrait to be completed.